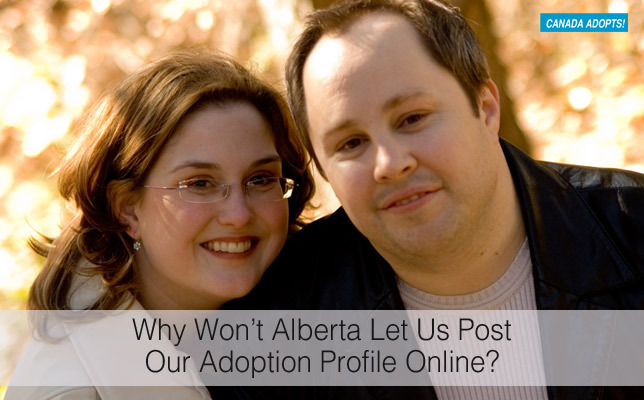 Why Won’t Alberta Let Us Post Our Adoption Profile Online? This guest post is by Valerie Bielenda, a hopeful adoptive parent. My husband and I are registered through a private agency here in Alberta and we’ve been on the wait list for almost three years now. I sigh loudly every time I think about it. We tried naturally to build our family for a long time too, but it just wasn’t meant to be for us. Realistically we could have had a 4- 5 year-old by now. When we first registered at our adoption agency, the average wait time was two years because they had quite a few placements in 2012-2013. Then in 2014 it turned out to be a really quiet year. A baby boom was happening — but not for adoptive parents. I won’t lie, we’re frustrated and we can’t be mad at the agency, it is what it is. So what can we do to possibly change things? Occasionally I look at the Canada Adopts! website and look at people’s profiles. I love/hate looking at them. How long will they be on the list? What do they have that we don’t? I can tell you right now the one thing that they do have is the freedom to post their profiles online. Alberta currently doesn’t allow parents in waiting to “advertise”. I use that term loosely, but I can’t think of another one to take its place. Why don’t they allow Albertans to post online? Well, that’s just not good enough for me. So this weekend I wrote to my MLA. I asked him to go to our provincial government and fight for us. It’s not going to happen right away, and it won’t happen with just one letter. If all of the parents in waiting wrote in, it would be a higher impact, they would have to listen, right? How would it help us? Hopefully it would cut down the wait time. That would be the ultimate goal. However, anything that helps people to understand what adoption is in the modern day, and not what it was, is a positive step for adoption. As an example, when I started to search online, “Adoption Canada”, the Canada Adopts! website comes up. I take a look and you see a great site that has some amazing profiles on it and great information about adopting in Canada. If I were a birth mom, I would like to view some of these profiles at home, while I’m waiting for friend at a coffee shop, on the bus or anywhere I am. Online is a more convenient way to look at these profiles than carrying around a bunch of paper copies. Don’t get me wrong, I love our profile, it’s gorgeous! But come on Alberta, it’s time to get modern! The more information that’s out there for birthparents, parents in waiting and adoptive families, the better for everyone. Yes, we have selfish intentions. We don’t want to keep waiting. We want that little one to join our family soon. I urge those in Alberta to write to their MLA’s. Ask them for their support and encourage them to take your plea to their peers. We need to change this current status, but it won’t happen without more people speaking up. You can find your MLA online here. If you need any help writing your letter, feel free to contact me at kartrite@hotmail.com. Best wishes and lots of love to you all! Valerie Bielenda and her husband, Mark live in Edmonton, Alberta, and can’t wait for that special child to join their family. Do you have an adoption story? We’d love to share it with our community. Email us any time or find details here. Previous Post“We’re Adopting!”: 42 Fun Ways To Celebrate Your Adoption JourneyNext PostAn Expectant Mother Has Chosen You To Adopt Her Baby. Now What?